Triple the output without tripling your costs with the new GMD 10030 disc mower. The GMD 10030 rear mount mower can combine with a KUHN front mount mower to create a triple-mount machine to take productivity to a whole new level. This machine has up to 32’6" of working width when combined with a front mount and it is quick hitch compatible with both Cat. 3 & 4N. The GMD 10030 has an independent hydraulic lift of the mowing units as standard, making point rows and oddly shaped fields no problem. The high-lift discs and lift-control hydro-pneumatic suspension ensure excellent cut quality and crop throughput even in the toughest of conditions. Fast-Fit® knives and the Optidisc® lubed-for-life cutterbar take the time and headache out of regular maintenance. 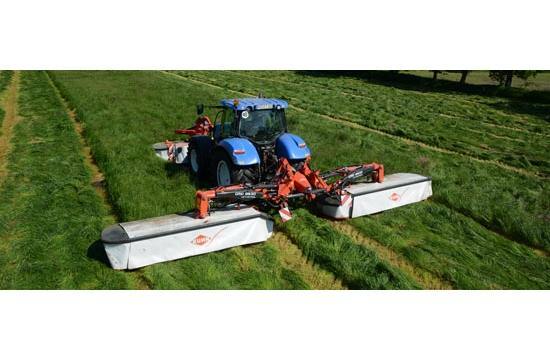 Should this mower strike an obstacle while working, the continuous hydraulic safety automatically pivots up and back minimizing the risk of damage. Working width: 32 ft.6 in. Average swath width: 9 ft.2 in.